his 50th club match at the weekend. New Norfolk I defeated St Virgils by the good margin of 50 runs at Tynwald Park. Winning the toss and having first hit, the Red Caps made 10 for 158 off 40.3 overs. Wicket-keeper/batsman Glenn Williams 37 (7x4s) and captain Rohan Heron 36 (4x4s) put on 57 for the opening partnership. Richard Graham and Adrian Eiszele were the next highest scorers with 12 each. In reply and after some great bowling, St Virgils was bundled out for 108 off 33.3 overs. Spinner Ashley Morgan led the way with excellent bowling taking 4-24 off nine overs. Stewart Rice bowled great line and length, containing the batsman and raking 3-26 (10) while Aaron Drew claimed 2-6 (1.3). Although the Red Caps can't make the finals they have done a great job in their first season in First Grade and a win this weekend against fourth-placed Campania would end their season on a high. In very warm conditions at Sandford on Saturday, Molesworth I handed Sandford a 155-run thrashing. Winning the toss, the home team sent Molesworth into bat to make the good score of 10 for 246 off 46.3 overs. Nick Piuselli has had a few runs in Fifth Grade of late, and returned to Second Grade to make a fine 64. Brad Coppleman did his usual thing, scoring yet another half-century with 51 which included 9 fours. Brayden Hodge batting at number 10 made 34 with 3 fours and 2 sixes, while openers Jake King 30 and Cody Neads 24 also played their part. In reply Sandford was bundled out for 91 and this wasn't helped by playing one player short. Doing the damage was Chris Slater who finished with fine figures of 4-24 from 10 overs. Brad Coppleman has had a great season to date and got 2-16 (6) while Josh Ransley and Brayden Hodge got one each. With one round remaining, Molesworth is looking to play a big part in the Second Grade finals. In the other Second Grade match, Gretna I gave up its chances of a playing finals cricket with a five-wicket loss to Claremont at Abbotsfield Park. The home side won the toss and sent Gretna into bat, resulting in them being bundled out for 105 off 32.3 overs. At one stage Gretna was 9 for 57, but thanks to a last wicket partnership of 48 by Daniel Browning 25 (4x4s) and Adam Browning 14 not out (1x4) the score got over one hundred. The only other player to score double figures was captain Ben Rainbird who made 17 (2x4s). In reply Claremont reached the total with the loss of five wickets. Corey Ransley 2-27 (10) and Adam Browning 2-20 (5) were the main wicket-takers while Daniel Browning got 1-21 (6). Congratulations to Claremont opening bowler Don Dykes who took 5-22 (10) in his 400th match for the club, not a bad effort from a 57-year-old. Playing at home, Bushy Park got back on the winners list with a six-wicket victory over fourth-placed Runnymede. The visitors won the toss and elected to bat, making 10 for 131 off 35.5 overs. Dylan Grant was Bushy Park's main wicket-taker with 3-50 (10). Trent Grant 2-10 (3.5), Blake Howlett 2-15 (3) and captain Troy Smith 2-32 (10) also did well. In reply, the Park lost just four wickets in the run chase, finishing 4 for 133 off 23 overs. Keeper Shaun Fenton led the way with a good 43 not out, Mitch Crosswell did his bit once more with 30 while Troy Smith 16, Dylan Grant 12 and Nathan Grant 10 all chipped in. Bushy Park has now locked in a double chance for the finals and with one round to go is looking a good chance to go all the way. Gretna II had a good 82-run win at home over the MacKillop Beltas. Winning the toss and batting, Gretna made the good score of 9 for 192 off its 50 overs. This total was mainly due to the ever-reliable Brian Smith who made 56 with 10 well-struck fours. Opener and captain Damien Hack made 21 (3x4s) as did Jordan Hastie while Luke Crosswell got 14 and debutant Ryan Emery made 13. In reply, the Beltas were bowled out for 100 in 32.5 overs. At one stage the visitors were 0 for 45 and looking the goods, but then came some fine bowling from the Gretna attack. Jackson Ackerly led the way ripping through the top order claiming 6 for 25 off 10 overs. Luke Crosswell got 2-22 (10) and Brock Nichols 2-29 (10) in what was a great effort. All though Gretna got the win, a finals berth is now out of reach. Congratulations to Damien Hack on playing his 250th club match for Gretna. He has given great service to the Gretna club for many seasons and let's hope we see many more. Well done also to Jordan Hastie on playing his 50th club match for Gretna on Sunday. Meanwhile a big well done to Ryan Emery who played his first senior match for Gretna and is now the 293rd person to play for Gretna since the 1977/78 season. Whats more, Ryan's father Bruce also played on Sunday and his number is 193. Ryan's older brother Cameron (number 239) has also played with the club. New Norfolk II went down to Marquis by five wickets at Tynwald Park. After winning the toss for the first time this season, and after a little dance, captain Josh Walsh elected to bat. After the first wicket fell with just 6, Mitchell Rice 25 (1x4) and Jarrod Browning 56 (7x4s) put on a great partnership of 95. Josh Walsh 38 (3x4s), (1x6) and Nathan Rice 19 (1x4) also put on a good partnership of 67. 14-year-old Nathan Rice did a top job batting for 30 overs. Brendan Skelly made 17 (2x4s). In reply the Marquis Tigers chased down the total finishing 5 for 194 off 42.1 overs. After his good stay at the batting crease, Nathan Rice bowled very well to take 2-33 (6) while Kendall Bluett 1-31 (7.1) and Brad Kemmler 1-39 (10) got the other wickets and there was one runout. New Norfolk II can not make the finals, but it's been a top effort by this side which came up from Fifth Grade last season. 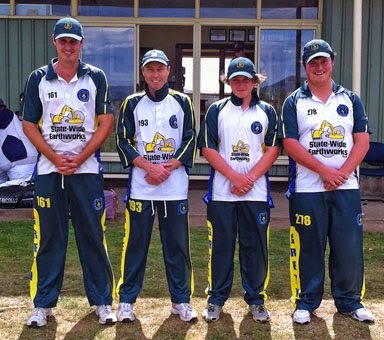 After winning their past four matches, Molesworth II went down to second-placed Knights by 26 runs at Pontville. Winning the toss and batting first, the home team made 8 for 146 off its 50 overs. Six of the seven Molesworth bowlers used took wickets with Josh Bomford with the best figures of 2-16 (7) and Jacjsyn Mann 1-10 (6). In reply Molesworth gave it a good shot, but was bowled out for 120 in 38.3 overs. Sam Triffitt 25 runs (2x4s) and Jake Foster 23 (1x6) were the leading run-scorers and Jacksyn Mann 17 and Tyson Gray 10 not out were the next best.